We are proud to present to you Thean Hou Temple! 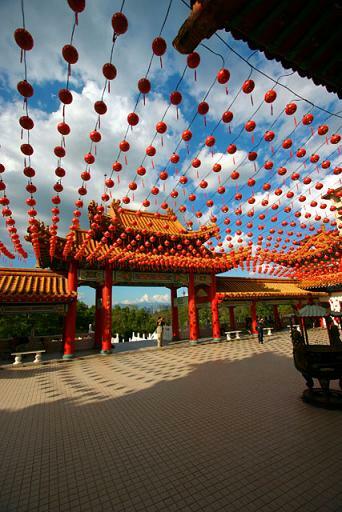 A striking 4 level, six-tiered Chinese temple located on a 1.67 acres (6,760 m2) of land atop Robson Heights along Lorong Bellamy, overlooking Jalan Syed Putra (Federal Highway). 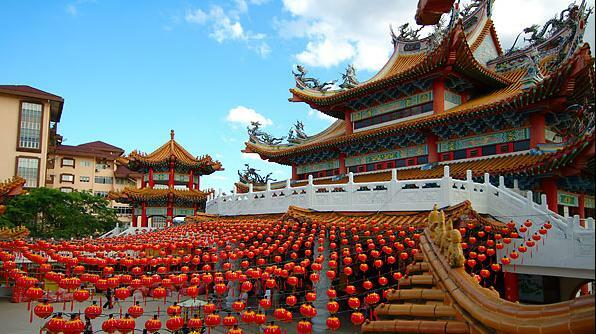 This magnificent piece of architectural beauty is the largest Chinese temple in South East Asia. This temple, built by the Hainanese community living in Kuala Lumpur is dedicated to Goddess Thean Hou (The Heavenly Mother). This place of worship with elements of Buddhism, Taoism and Confucianism is a marvelous structure and represents a successful combination of modern architectural techniques and authentic traditional design featuring decorative beams, spectacular roofs, domed ceiling, calligraphic couplets, murals and elaborate embellishments. Non-Buddhist often frequent this place as its grand architecture has made it a popular tourist destination. 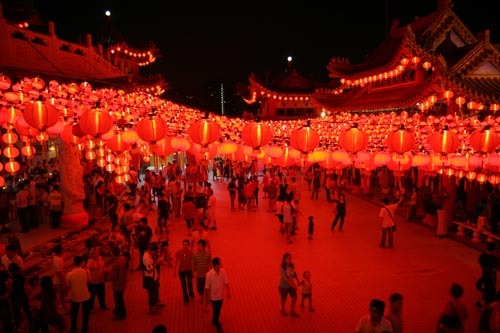 Thean Hou Temple is managed by the Selangor and Federal Territory Hainan Association, the temple belongs to the Chinese community in the country and public donations have enabled the famous tourist destination to develop by leaps and bounds. Its ground breaking ceremony took place on August 30th 1981. RM7 million was the grand total that was spent and was completed in 1987. Tan Sri Lee Kim Sai who was then the Housing and Local Government Minister officially opened the temple on September 3rd 1989. Before you enter the temple grounds there is a fountain of Kuan Yin, the Goddess of Mercy and statues of gods and lions. A collection of other large statues that include representations of the twelve animals of Chinese astrology are also displayed at the temple grounds. The front entrance of the temple features a multi-arched gateway with red pillars, the colour symbolic of prosperity and good fortune. The temple consist of 4 levels. The lowest level consist of the nursery, souvenir shops and food court while the first floor is the main hall where cultural and religious activities are held. On the second level, one can find the marriage registration office and resource centre. The main temple shrine is located on the third floor. This level has 3 tiers. 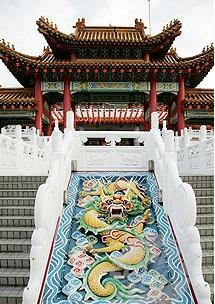 Upon reaching the temple shrine, one will be amazed by the dragon-inspired columns and pagoda rooftops. It is also a perfect place to relax and enjoy the panoramic view of the temple set against the Kuala Lumpur skyline. The prayer hall houses 3 altars, each with a sculpture of one deity or goddess. As one enters the prayer hall, the altar on the right is dedicated to Guan Yin, the Goddess of Mercy. Theau Hou is in the centre while Shui Wei Sheng Niang (the Goddess of the Waterfront) is at the left. In the middle of the hall and between the altars are two pairs of Kau Cim oracles that can be used by visitors. In addition to her altar in the prayer hall, there is also a smaller statue of Guan Yin to the right of the hall, set amongst rocks and falling water. Here one can kneel and receive a blessing of water from the statue. This is also a popular destination for couples to take their wedding photographs. The temple is also renowned for its marriage registration services offered. Approximately 5000 young couples register at this temple annually.